Honda has revealed the first official images of the CR-Z MUGEN, a more powerful, performance focussed version of the CR-Z coupe. The car is still in development, but the supercharged engine looks set to deliver similar performance to the Civic Type R, while still achieving reasonable fuel economy. "Early fuel consumption tests have also been encouraging," says Colin Whittamore from MUGEN Euro. "We've retained the three driving modes from the standard car and economy ranges from 50+mpg in 'eco' mode to mid-30 mpg when tapping into the supercharged power in a special 'MUGEN' mode." 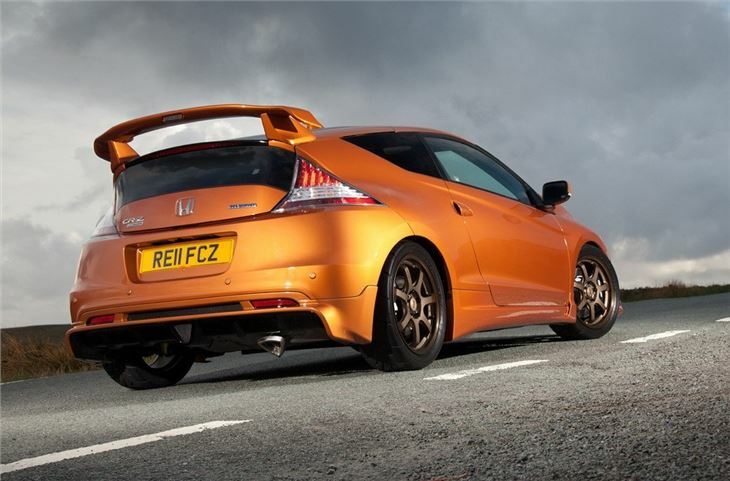 The overall weight of the CR-Z has been reduced in addition to the performance enhancements. A new rear spoiler, restyled bumpers and side skirts and lightweight alloy wheels give the CR-Z MUGEN a more focused external look, and inside the cabin a stainess steel gear level, metal detailing, boost gauges and Recaro bucket seats set the MUGEN model apart from the standard CR-Z. Official on-sale dates and pricing are as yet unavailable.